The Challenge Series is a series of timed RMCC events that are for riders who are interested in testing their limits against the clock, featuring lots of climbing and ranging from 50 to over 200 miles in distance. The 2012 Joe Lookingbill Denver-to-Aspen Classic is in the books! And it truly was a classic! For the first time in recent memory, the cycling gods and weather gods came into near perfect alignment to produce near "perfect" weather conditions, conducive for comfortable riding conditions and blazing fast times for many riders. In the end, Mark Lowe and Ryan Franz both eclipsed the 10-hour barrier, a first for this event. 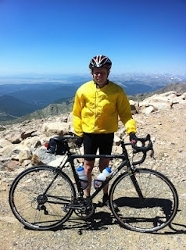 Mark's 18.62 average speed bettered his 2011 course record by 24 minutes. Congratulations to all of this year's riders! Thanks to Charlie Henderson and Dan McDonald for providing event support for this year's Denver-to-Aspen. The Death Ride course features 16,000 feet climbing in 225 miles. It is the most difficult single-day event on the RMCC event calendar and the longest double century event on the Ultramarathon Cycling Association's (UMCA) Ultracycling Cup event calendar and arguably the highest as well, crossing three passes that exceed 10,000 feet in elevation (Molas Pass, Coal Bank Pass, and Lizard Head Pass) and one pass that even exceeds 11,000 feet in elevation (the notorious Red Mountain Pass). 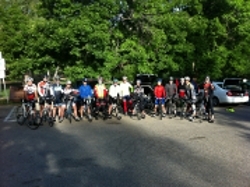 This year's Death Ride had record attendance: 18 ride starters, including 15 Death Ride rookies! Riders encountered generally favorable weather conditions, but temperatures were much warmer than in previous years, ranging 10-15 degrees warmer than in 2011. However, there were headwinds in places (Rico, Dallas Divide) where there is generally a prevailing tailwind. In the end, Mark Lowe eclipsed last year's course record time by seven minutes. Mark noted, "this record belongs to Ryan [Franz] and Marc [Moons] as much to me. Without their hard pulls during the first 81 miles to Durango, I never would have been in position to beat last year's time." Congratulations to all of this year's Colorado Death Riders! 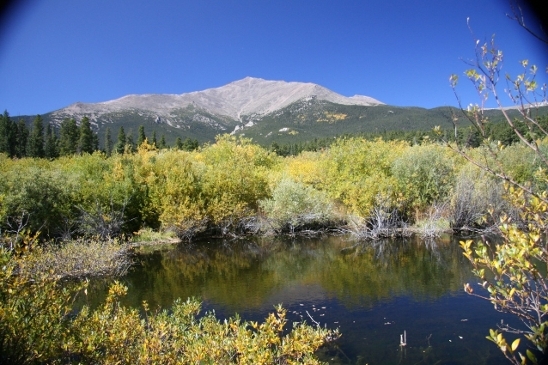 The Grand Loop, one of most Colorado's epic single-day cycling loops, features over 15,000 feet of climbing in 200 miles. The loop traverses Rocky Mountain National Park via Trail Ridge Road, one of the most spectacular high altitude highways in the world. This year's event had an excellent turnout, including 20 ride starters and 19 finishers. Riders encountered pleasant, crisp riding conditions to start this year's event. The pleasant weather conditions persisted all the way to Berthoud Pass, over 150 miles into the ride. The dry, cool weather conditions, however, eventually yielded to clouds and heavy rain showers for riders who finished the home stretch from Berthoud Pass to Golden, CO after 1 pm. Congratulations to all of this year's finishers for completing Colorado's grandest cycling loop! Tim Kalisch would have been proud of the effort that all of you put forth this weekend! The Cripple Creek Crippler, the RMCC's newest double century challenge, is one of the nation's toughest double century events. This event is not for the feint-of-heart (or the weak-kneed!). The "Crippler" course has over 18,500 feet of climbing! After a very early 4 am start, the field of 13 participants spread out very quickly. A small group, including the Colorado natives Eric Nelsen and Mark Lowe, and Marc Moons of Petaluma, CA, set a brisk pace up the climbs through the Evergreen backroads to Conifer and Deckers. As the trio pulled out of Deckers, Mark went on the "offensive," picking up the pace during the 23 mile, 2,500 foot ascent from Deckers to Woodland Park. 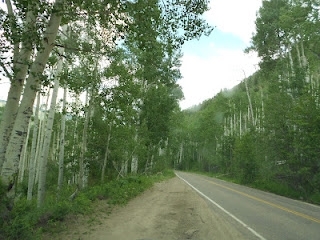 After grinding up the relentless, steep ascent to Cripple Creek, riders were stunned to discover that CO 67 had been closed because of a large sink hole that had opened up in the middle of the highway. A quick course revision was implemented to turn the event around in Cripple Creek, running an out-and-back course from Cripple Creek back to Ken Caryl, thus salvaging the event. The revision, however, ended up adding an additional 1000 feet of climbing to the event! 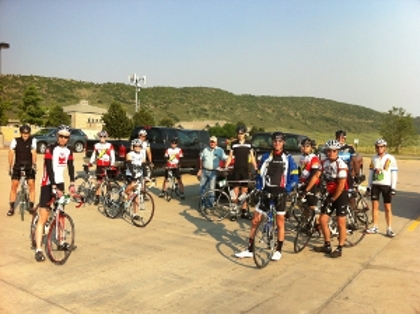 At the conclusion of the event, 12 of 13 ride starters successfully completed this year's Cripple Creek Crippler. By the time riders had completed the out-and-back course from Cripple Creek, total climbing estimates were just under 20,000 feet of vertical gain in 210 miles...not a bad day's work!! Congratulations to all of the participants! Eleven riders completed the Triple Crown Stage Race in 2012. Congratulations to all of the riders and to Mark Lowe for again taking the crown! Thirteen RMCCers "toed the line" for the start of the 2012 Foothills Climbfest, contested on Saturday, May 26, 2012. Starting at the Ken Caryl RTD Park-n-Ride, the Climbfest is a grueling test of cycling perseverance, climbing well over 8000 feet in 80 miles. 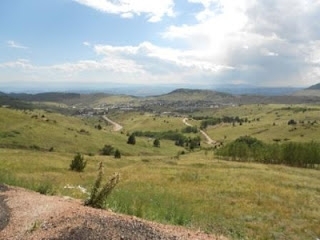 The route includes five climbs in the foothills to the southwest of Denver, including Deer Creek Canyon/High Grade Road (a true foothills classic), Shadow Mountain/Brook Forest, Parmalee Gulch, High Drive Road, and Brook Forest/Shadow Mountain (in reverse). The Climbfest has become a mainstay on the RMCC calendar over the past few years. Like other RMCC Challenge Series events, it's not officially a race...but it's as close to race as any event on the RMCC calendar. Riders are encouraged to push themselves to the maximum of their cycling limits and friendly competition is encouraged. In spite of the tough weather conditions, riders set a blistering pace up High Grade Road early during the first climb of the day. Seth Stingley, a RMCC new-comer from Palmer Lake, set a very hard pace up the 3,000 foot Deer Creek Canyon/High Grade Road climb, with club veteran Mark Pfeil not too far behind. Not familiar with Climbfest course, Seth made an untimely wrong turn in Conifer, allowing Mark to slip into the lead....a lead that he would not relinquish for the remainder of the event. Mark finished in 4:54. Crafty club veteran, Steve Rudolph, who fell victim to a flat tire, battled back in third position with a time of 5:01. Congratulations to all of this year's participants! *Finished after the official 7 hour time limit. A small (but hardy) contingency of RMCCers lined up for 2012 edition of the Mt. Evans Challenge. This RMCC Challenge Series event features over 9,000 feet of lung-searing climbing to an altitude of 14,127 at the top of Mt. Evans, North America's highest paved road. 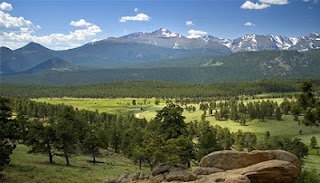 With temperatures well over 100 degrees in the Denver area, the event marked an opportunity for participants to escape the unusual June heat in eastern Colorado to the much cooler temperatures at the Mt. Evans summit! Congratulations to all this year's riders, all of whom put in a good ride! Fifteen RMCCers lined up for the inaugural Boulder Fearsome Five on Sunday, May 6, 2012, a new, extremely challenging RMCC event. This event features a unique format: Participants had ten hours to climb (and descend) Boulder County's five most difficult climbs, including Flagstaff Road, Magnolia Road, Sugarloaf Road, the Fourmile Canyon-to-Sunshine Canyon Loop, and James Canyon/Overland Road (aka the "SuperJamestown") via Lee Hill Road. Mile-for-mile, this is the most difficult event the RMCC has to offer, featuring multiple climbs with insanely steep pitches. And given the steep grades and high altitude, this course is very likely the most challenging century course in the nation! 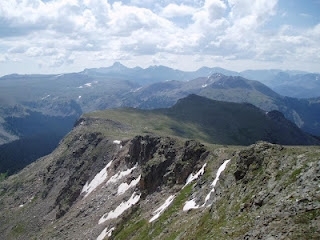 The route climbs over 14,000 feet in a mere 98 miles. It also includes a tricky, somewhat technical (for road bikes) seven mile dirt and gravel section during the climb up Fourmile Canyon, through the community of Gold Hill, and windy descent down the upper three miles of Sunshine Canyon. Congratulations to all of the riders who came out and attempted this ride! The RMCC Copper Triangle was contested on Saturday, September 9, 2012. 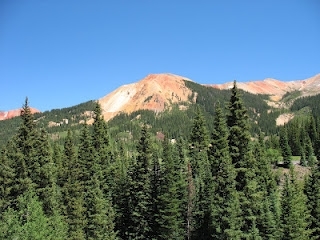 The Copper Triangle is a Colorado classic! Well-known to cycling enthusiasts, the route features 6,000 feet of climbing over Fremont Pass (11,318 ft), Tennessee Pass (10,424 ft), and Vail Pass (10,666 ft). Brisk temperatures (upper 30s) greeted riders at the start. But temperatures rapidly warmed into the low 70s as the morning progressed. Riders encountered perhaps the best weather that we’ve ever had for this ride! Sunny, cloudless skies and very light winds, coupled with the early autumn foliage on Fremont Pass and Tennessee Pass, made for a spectacular morning of riding! Riders did encounter an unexpected construction zone along US 24 to the north of Leadville, but this delay didn’t damper the spirits of the riders too much. In the end, RMCC youngster Seth Stingley had the "liveliest legs" ascending the day’s final 3,000-foot climb up Vail Pass, ultimately posting a time of 4:14, an excellent time given the ten minute delay at the construction zone! It was also excellent to have long-time RMCC veteran Harris Rosenthal back in action for this final challenge series event of 2012!